Amazon announcement of the Kindle Fire HD marks a significant shift in the tablet space, as the online retail giant takes the fight directly to the current market champion Apple, and lays the way for a more content-driven future of tablet computing. 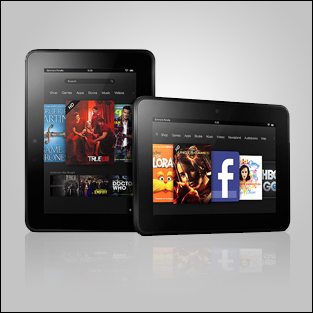 In case you didn’t catch the news last week, Amazon has launched three new tablet devices in its Kindle Fire range. First you’ve got the flagship Kindle Fire HD. This tablet boasts an 8.9 inch display, slightly smaller than the iPad’s 10.1 inch screen, a front facing camera, quad-core processor, front facing camera and 16GB of storage. Then you’ve got the 7-inch version of the Kindle Fire HD, which is virtually identical apart from the smaller 7-inch display 1280×800 display. At the budget end of the family is the new Kindle Fire 2, an updated version of the original Kindle Fire, which boasts increased RAM and processor speed, but doesn’t quite have the cutting edge specs of the HD-branded tablets. Ok, you might say, what’s the big deal about these two new devices? Well, firstly the price point is a big shot across Apple’s bow. The Kindle Fire HD has almost the same screen size as Apple, and objectively better specs, yet is priced at a mere $299 for the WiFi version (UK prices have to be announced), while Apple’s WiFi iPad is $499 in the US. The Kindle HD’s 7 inch version is even cheaper, at $199, while the Kindle Fire 2 is just $159. What does this mean? It means Amazon is playing a very different game to Apple. Whereas Apple makes a huge margin on iPad sales (making it the most profitable company in history), Amazon is very likely making a loss on the Kindle Fire. There’s no official figures, but some have estimated the original Kindle Fire was being sold at loss of $20 per unit. So if Amazon is making a loss on sales, it’s hoping to make it’s revenue purely on selling content. Amazon is invested heavily in buying content and creating content that can be consumed via tablet devices. Its Amazon Prime streaming video platform recently signed a major deal with Hollywood studio Epix, which will see hundreds of box office hits, such as The Avengers and The Hunger Games, made available to subscribers. Then there’s Amazon’s own ‘Amazon Studios’, a project that aims to crowd source content production for everything from childrens’ cartoons to feature films. All eyes will now be on Apple’s press event this Wednesday. Amazon has delivered both a larger 9-inch iPad rival and a 7-inch continuation of the Kindle Fire and Google Nexus rival. Many analysts believe that Apple is gearing-up to follow suit, by releasing a 7-inch version of the iPad. The end game here is that larger 10-inch tablets eventually become laptop replacements, and cheaper 7-inch devices become content consumption/entertainment devices. But can Apple compete against Amazon’s low price point? Does it need to? Either way, the tablet market is starting to really heat up. To learn more about our tablet and mobile app development services, click here.